It's been a great reading week for me: I got to re-visit the Casson family, which is always a joyful experience; I got to meet (and develop big fat crushes on) some new, fabulous John Green creations; and I was able to return to Bayern and Tira, to Isi, Enna, Finn and Razo. All that and it's only Wednesday. Yay July. River Secrets is the story of Razo, who was a (very) minor character in The Goose Girl and who was originally supposed to continue being a (V)MC in Enna Burning. According to Shannon Hale's Reader's Note, Razo "wormed his way" into a more significant role in Enna Burning. She'd never planned on giving him his own book. But, as she said, he's insistent. Unlike Isi and Enna, Razo doesn't speak the language of wind or fire. He isn't an amazing fighter like Finn. He's flabbergasted but happy (and yes, nervous) when he's chosen to be one of the few people sent to Tira with the ambassadorial contingent. * Most of his fellow soldiers assume he's been chosen because he's a friend of the queen. Frankly, Razo assumes the same. But he's wrong. Talone, Razo's captain, wanted him along because he thinks that Razo has the makings of a great spy. 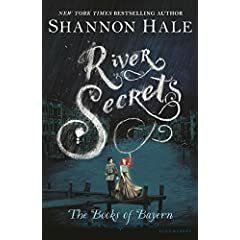 River Secrets is full of action, intrigue and romance. It's classic Shannon Hale -- superb writing, likable characters and a world that I wouldn't mind stepping into. It's set in a whole new country, with a whole new culture and a whole new set of dangers. The magic system is the same -- without giving anything else away, I will say that the title is significant. I love, love, love Mo Willems.